Thunderbolt carries PCIe and DisplayPort, which enabled Apple to change the role of its display. The Thunderbolt Display is no longer a passive monitor, but it's a full fledged docking station. Thunderbolt can carry PCIe x4, that's four lanes, which gives Apple the ability to put four PCIe x1 devices in the display itself. Apple chose wisely and included a Broadcom Gigabit Ethernet controller (BCM57761), a FireWire 800 controller and a USB controller. The FaceTime HD and integrated audio codec both use the internal USB controller. Just to be clear, these controllers are present independent of what you connect to the Thunderbolt Display. If you have a Mac with an integrated Gigabit Ethernet controller, hooking it up to the Thunderbolt Display now gives you two GigE ports - and you can use them both in tandem if you'd like. The same goes for FireWire 800 and USB. Apple doesn't see the Thunderbolt Display as a way to offer more expansion ports, but rather a way to shift those ports to a different location. Chances are you won't need GigE while mobile, but you would like it while at your desk. The same goes for FireWire 800. 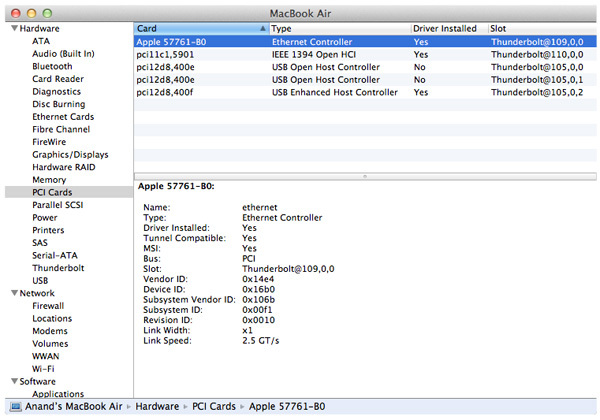 What's particularly awesome about the Thunderbolt Display's integrated controller farm is what it does to MacBook Airs. 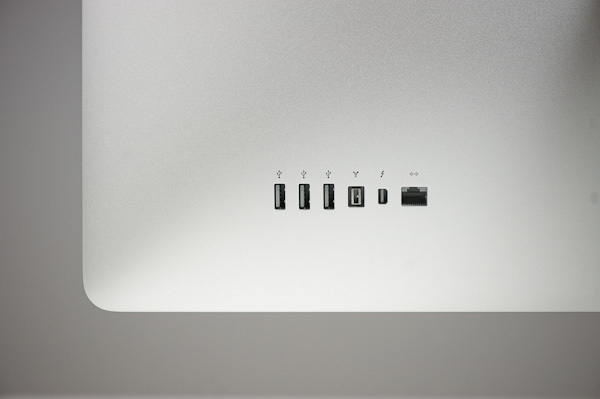 The 2011 MBAs ship with two USB ports and a Thunderbolt port, that's all you get in terms of high-speed IO. With their internal SSDs capable of moving data at up to 200MB/s, you're quickly bottlenecked by the MBA's 802.11n WiFi stack. Had Apple included a Gigabit Ethernet port on the MBA it would ruin the thin form factor. The Thunderbolt Display takes care of all of this. Connect a MacBook Air to a Thunderbolt Display and not only do you get more pixels, but you get more connectivity. 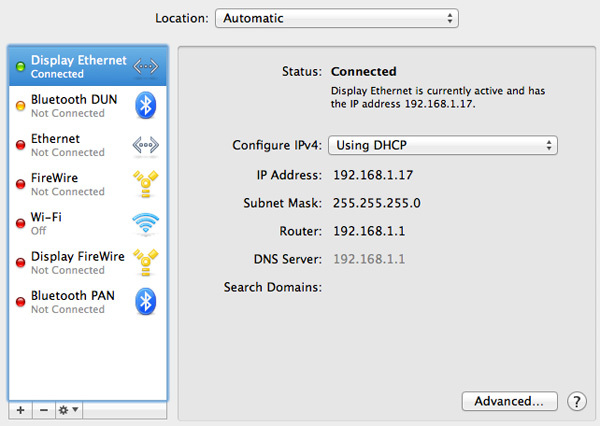 Gigabit Ethernet and FireWire 800 are now retrofitted to the MacBook Air. For those notebook-as-a-desktop users who migrated from old MacBook Pros to the 13-inch MacBook Air, the Thunderbolt Display is a must-have. The biggest feature for me is Gigabit Ethernet. For large file transfers 802.11n just doesn't cut it. While connected you can use the Thunderbolt Display with your MacBook Pro/Air closed or open as a secondary display just like you could with last year's 27-inch LED Cinema Display. The Thunderbolt Display not only adds functionality but it also simplifies cable management as a result. Users who are constantly docking and undocking their notebooks now only have to deal with two cables: power and Thunderbolt. Whereas today I have no less than seven cables plugged into my notebook. What's missing from the Thunderbolt Display's port repertoire? For starters, there's no analog audio out. While the display does feature a pair of integrated speakers, they don't produce the best sound in the world. Thanks to their diminutive size and unusual enclosure, the speakers don't cover a lot of dynamic range and you can forget about any ultra low frequencies. If you like bass, you still need a sub. Unfortunately there's no way to use the display's integrated audio codec to drive external speakers. You either have to plug a 1/8" stereo cable into your Mac or buy a USB sound card and connect your external speakers to it. In my opinion this is a pretty significant oversight. It either defeats the purpose of the simplified cable setup by requiring you plug in yet another cable into your Mac to use external speakers, or it defeats the purpose of having an integrated audio controller since you need another USB audio controller to get audio out. This is something Apple could've easily solved by just including a 1/8" jack on the back of the display. Apple has done a great job of including SD card readers on most of its Macs (although I'd love one on the 11-inch MBA, ahem #waystomakeanandhappy). The Thunderbolt Display oddly enough doesn't include an SD card reader. If it weren't for this and the missing 1/8" jack you'd have almost no reason to reach over to your Mac once at your desk. There's also no USB 3.0 support. While Thunderbolt does enable some very high speed IO, there are still far more USB 3.0 devices than Thunderbolt devices. Not to mention that you likely won't see Thunderbolt enabled flash memory sticks but we already have quite a few portable USB 3.0 drives. USB 2.0 is just ungodly slow today and I'd much rather have Apple introduce USB 3.0 support with its first Thunderbolt Display instead of introducing it with an updated version down the road. The controllers are available on the market today, although it won't be until next year with Ivy Bridge before Apple considers enabling USB 3.0 on Macs. The final complaint shouldn't come as a surprise, but the Thunderbolt Display just doesn't have enough USB ports in my opinion. The MacBook Pro & Air come with two, while all desktop Macs have at least four. The Thunderbolt Display only gives you three. USB hubs are easy to come by, but I would've preferred to see at least 4 or 5 on the display. Maybe I'm slow to the party, but I'm loving this video review Anand. It was a very well-done video, everything from lighting and sound to the presentation was very well done. +1! Love the way Anand and reviewers have been using these video's to supplement the written content, it's a great added bonus. And I agree, it would be great for things like case, monitor, and smart phone reviews, things of that nature, but not so much for a hard drive or SSD reviews, for instance. And it seems like that's precisely the way the video reviews have been used thus far. For one it is a very concise version of the full review, and it complements it very well. Just the quick and dirty info on what Apple has been up to, and as this will do nothing for me as a PC user I now know I can stop there; if I want more detailed info I have the full review at my disposal, pretty cool. The other obvious benefit is the video format itself has advantages over still images for products such as this.